I wanted to use up a number of fresh ingredients that I had in the refrigerator and thought that I'd make a kind of stew and serve it atop brown rice noodles. I added all of the ingredients except the onion into my Instant Pot pressure cooker and cooked for 2m. Dinner was surprisingly good, which I credit to the great flavor that my pressure cooker imparts to my dishes. It was particularly good with a bit of hot sauce added at the table. I should more often do a refrigerator cleanup in this way! I made a quick and easy dinner by cooking frozen edamame pods, uncovered, in boiling water for 6 minutes. I put sticks of carrot maybe 4" x 1/2" atop the pods to gently cook the carrot. I also flame-roasted cobs of corn over my gas range, stripped the kernels, and mixed in lemon juice and salt. Some cucumber completed the meal. 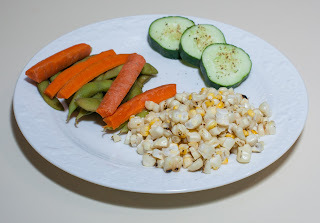 I served the edamame with carrot; at the table, we could remove the edamame beans by putting each pod in our mouths and pulling, eating the beans and composting the shells. Dinner was good and healthful but not particularly sophisticated. I should cook edamame pods more often - they're quite tasty. I have two Instant Pot pressure cookers and only recently got a smart phone to use the Smart Instant Pot with bluetooth wireless connectivity. Both pots are essentially the same, but the smart one allows control from and feedback to a smart phone. I decided to give it a try with tonight's dinner. 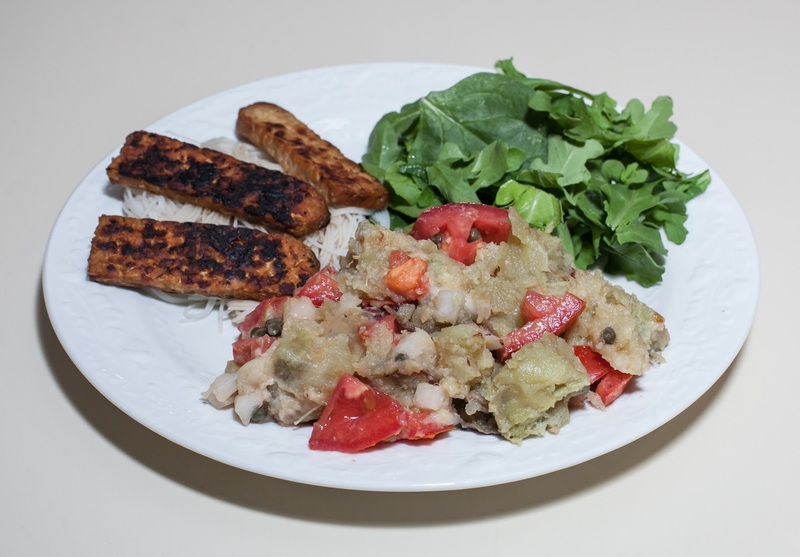 I found some good looking organic roma tomatoes in the store today, and thought that I'd make a sweet potato - tomato main course with sauteed tempeh on the side. Here is what I did. After the cooking was done, I waited a few minutes and gently released pressure, then cut the sweet potatoes into 1" cubes. I had put the garlic in, expecting it to end up like roasted garlic and that I would be able to squeeze gel-like the garlic out of the skin - and that's exactly what happened. I squeezed the garlic cloves atop the sweet potato. I mixed in the remaining ingredients and served. We all liked dinner. The combination turned out to please us all. The sweet potato was quite creamy. Oh - the bluetooth control was fun; I enjoyed watching the details of temperature, pressure, time left, etc. on my phone. The sweet potato was quite soft and could have cooked for less time. I've noted a 10-19m pressure steam time, but that's for an intact sweet potato. I'll bet l could have cooked for just 10m. 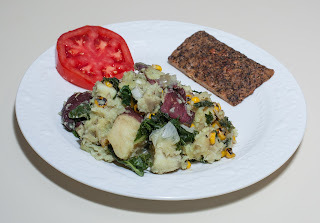 I should try more dishes with sweet potato and raw vegetables or fruits. My daughter and I were shopping at Whole Foods Market today and saw a prepared main course of arugula and corn, which inspired me to make something even heartier with seitan. 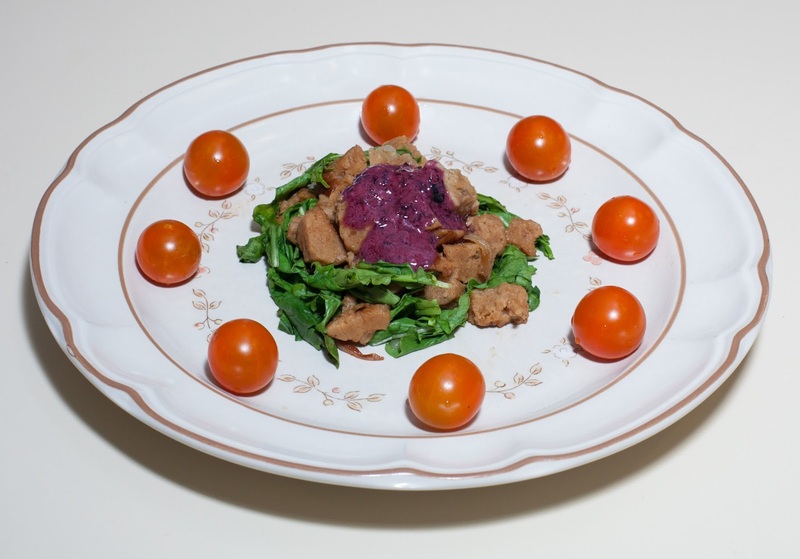 As I was starting to make the dish, I decided to stick with just onion, seitan, and arugula (and baby spinach, as I only found arugula packaged with it) to let the dish focus on these flavors. I wondered what a raspberry vinaigrette might be like with it; I didn't have raspberries, but did have some tasty organic blueberries. I found a nice recipe for a blueberry vinaigrette, and was delighted that it included yogurt as an ingredient; I've been wanting to cook with the yogurt that I am regularly making now. 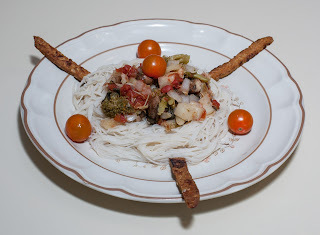 Here is the simple dinner that I crafted. I put the onion and then the seitan into my large Saladmaster stock pot and cooked waterlessly for about 15m (i.e., had the heat on medium high and covered the pot; when the vapor release valve started clicking, I reduced the heat to low till the clicking mostly stopped and continued to cook, covered for 15m). I turned the heat off and stirred in the arugula-spinach mixture, then covered the pot again and turned the heat on to medium for a minute to let the waterless cooking go a bit more then turned the heat off and let the pan sit, covered, for 2m or so to let the greens wilt. In the meantime, I blended the vinaigrette ingredients till homogenized, just 10-15 seconds or so. Dinner was great! We were all pleased with the combination in the main course. I should have used the entire 5 ounces of my arugula/spinach as I think a bit more greens could have been good. Cooked arugula is a good idea and I should explore this more. Oh, that vinaigrette was excellent! I should make vinaigrettes and sauces more often. I purchased a chayote squash for the first time. I had read that it tastes good raw or pressure cooked for 2 minutes after being cubed. Here is what I did. I put the lentils, water, and bouillon cube into my Instant Pot pressure cooker. 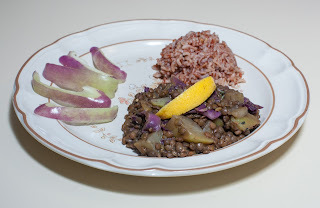 Lentils should take about 7 minutes (like when I made a French lentil dish back in May 2014) and I wanted to cook the squash for 2 minutes, so I cooked the lentils for 5 minutes. After the cooking was done, I could have waited a few minutes and gently released pressure, but I did the first step well before I needed to continue so was able to just open the top since the pressure was reduced. 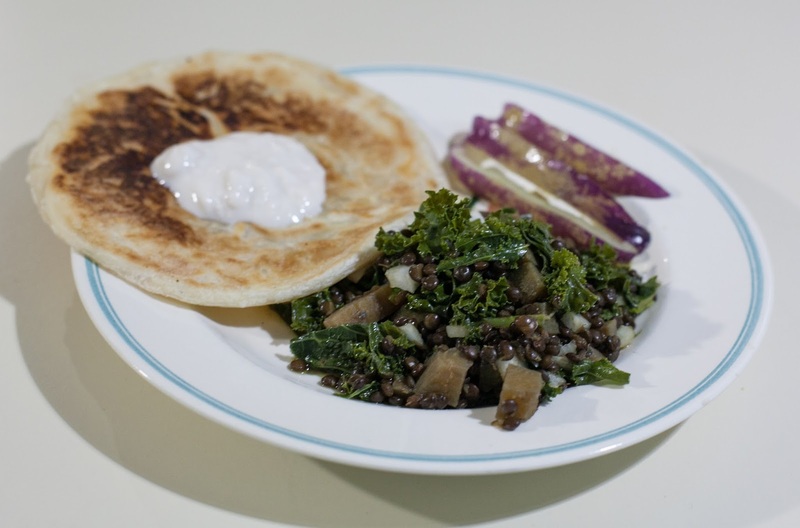 The lentils tasted quite done and good after just the 5-minute cook time! I added the squash after tasting it raw. It was good raw and reminded me a lot of jicama. I decided to cook under low pressure for the remaining 2 minutes. I did that, after also adding the garlic, turmeric, sesame seeds, and fennel seeds. When I was ready to serve, I opened the pot slowly, and added onion, salt, and lemon juice. I served with Madagascar Pink rice. Dinner was good - and I forgot to add the onions in! My daughter doesn't normally like squash, but this chayote squash doesn't at all taste like other squashes that we've had. For a change, I liked my meal more than my wife did; we both liked it, but I thought that the combination was particularly good. She wanted a bit more treatment of the squash. Speaking of onions, my wife did prefer onion, which I added at the table to her plate. I was fine with no onion. I'm delighted with the 1: 2.5 ratio over 5 minutes of pressure for the French lentils - and wonder if 4 minutes would be enough as the lentils were a bit soft. I love how they come out and form a thick base for additional ingredients. I should cook with French lentils more often. I should buy chayote squash again and serve it raw, thinly sliced. I should also experiment with more cooked dishes, perhaps coating the squash with bread crumbs or just preparing it with more ingredients, such as carrots and sweet potato. I wanted to make a black beluga lentil dish and used the results from when I last cooked with these lentils in May to use a 1:2 ratio of lentils to water (actually, broth - I included a vegan bouillon cube) cooked for 25m. Here is what I came up with. I put the lentils, beet, kale, bouillon cube, and water into a small stock pot and brought the contents to a boil, then simmered for 25m. I added the onion, lemon juice, and salt, and served. I bought some prepared layered parathas (Indian flatbread); each bread had 9.5g of fat, so I won't classify this meal as a no added fat one. I added a dollop of my homemade yogurt. 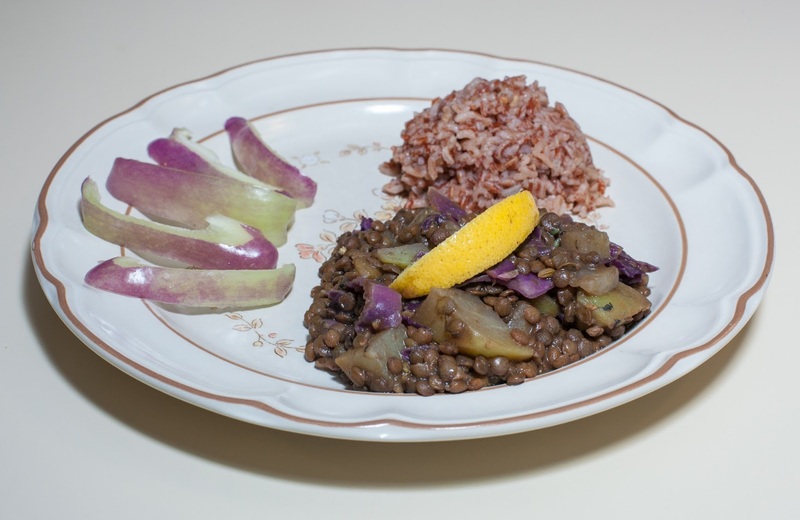 I loved the beets with lentils. The beets cooked nicely! For some reason, red beets sometimes bother my digestion, but yellow ones don't. I should make more beet dishes, and include the beet greens. My daughter is having some pain in her gums (and some good vegan ice cream is in order for tonight after dinner!) and wanted to have soup. My Instant Pot makes delicious soup. Here is what I did. I put all of the ingredients except the lemon juice into my Instant Pot pressure cooker and pressed the "Soup" button, meaning a 30m pressure cook time. After the cooking was done, I waited a few minutes and gently released pressure, then added the lemon juice and served. I also made some simple guacamole and served it over lettuce greens. We love Smiling Hara brand tempeh; I remarked over dinner to my wife that the dry-rubbed smoked salt and pepper hemp tempeh is probably my favorite tempeh, and she agreed. I had sauteed it with no oil on a cast iron pan after cutting the tempeh first in half, width-wise. We all enjoyed dinner. I had concluded that tofu, but not tempeh or seitan, benefits from pressure cooking, but a long 30m pressure cook time was nice for the seitan in the soup, softening it. We all liked how the artichoke heart tasted in the soup. I should experiment with cooking seitan under pressure over, say, 15 or 20m or more. The pressure cooker makes such great soups - I should make soup more often. We had a friend of my daughter's over today who is gluten-free. Luckily, most of my cooking is gluten-free. I decided to make some sort of rice and beans dish using pinto beans, but then instead decided to use corn - our coop, Weaver Street Market, has been getting organic corn! Here is what I did. I put the beans, water, garlic, kale, and bouillon cube into my Instant Pot pressure cooker and cooked for 30m. After the cooking was done, I waited a few minutes and gently released pressure, then added the scallions, lemon juice, nutritional yeast, oregano, and salt. Dinner was good; my daughter's friend had two servings of beans. 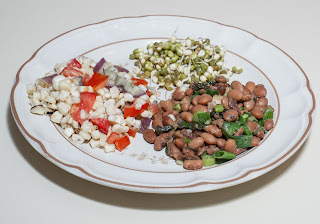 I've not often used pinto beans in my cooking, but loved how soft and tasty they were today. I should use pinto beans more often. I put the cup of water into my Instant Pot pressure cooker, then put the sweet potatoes on top of the steamer rack so that the potato wasn't touching the sides. I had meant to do a 16 minute pressure steam, but did a simple 16 minute pressure cook. After the cooking was done, I waited a few minutes and gently released pressure. The sweet potatoes were perfectly done; my goal was to undercook them and complete their cooking with other vegetables. I put the onion into my large Saladmaster stock pan and cooked on low, stirring occasionally, for 2 or 3 minutes till the onion was getting clear. I then added the sweet potato, kale and corn and covered, letting it cook waterlessly for 10 minutes. 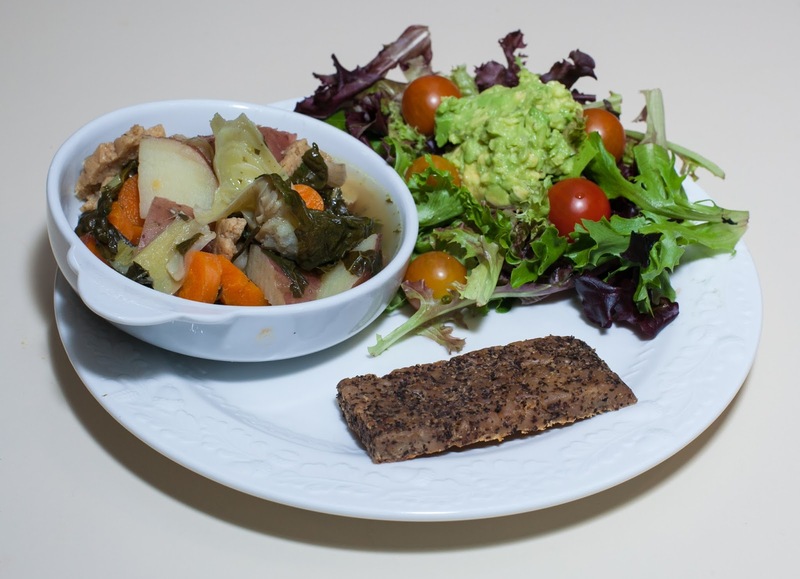 I served along with sauteed (with no oil) smoked salt and pepper dry rubbed hemp tempeh and salad. Dinner was great! I loved the Japanese sweet potato and actually was reluctant to continue cooking it. I kept the skins on for more nutrition, which also added to the appearance. I need to serve these wonderful sweet potatoes as their own side dish sometime soon. 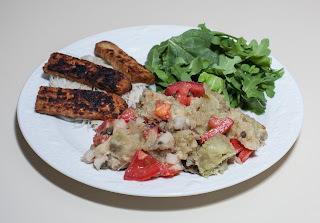 I love the hemp tempeh; if it weren't expensive, I'd buy it more regularly. I served along with sauteed (with no oil) hemp tempeh and salad.